Looking for the perfect easy-to-prepare recipe for your Easter celebration? 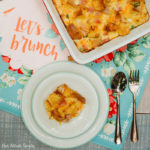 Try this Easter Brunch Casserole with ham and cheese! To begin, preheat your oven to 375 degrees F. Cut your bread into cubes that are about 1-inch each. This is a great way to use up day-old bread, biscuits, English muffins, croissants – really any baked goods will work here. I used a loaf of ciabatta bread. Lay 4 cups of cubed bread on a baking sheet and place in the oven for about 10 – 12 minutes until it begins to get toasted. Set out to cool. Gather the remainder of the ingredients and prepare them by dicing the ham steak, shredding the cheese, slicing the green onions, and cracking the eggs. Butter a large casserole dish. Place the toasted bread at the bottom, add the ham, cheese, and green onions, and pour the egg over the top. Gently mix the ingredients together so that all the bread cubes are coated with egg. Season with salt and pepper, and bake for 30 minutes, until the eggs set.